Ground earth pigments are mixed with natural bases and oils to produce my paints. Hand crafted arrowheads, shells, feathers, are hand sewn, wrapped, and tied with sinew. 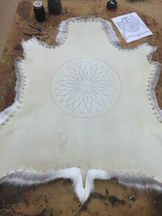 Genuine animal hides such as caribou, deer, elk and buffalo are used. To be creative, you must connect with what inspires you. Lose your fear of making mistakes. Don't think about it; just let it come to you. Creativity has a never-ending source, and when you let it out, it fills you up again. Mainly self-taught as an artist, I have been involved in creative activity for the past 35 years. Beginning with a career in the commercial arts industry, I have since evolved into fine crafts and painting. I have always been inspired by my natural surroundings. Having traveled throughout the west in search of insight, my artistic expressions are a true reflection of my experiences. I feel that my natural, rustic style and attention to detail are what make my art so unique and appealing. My materials are as genuine and natural as possible. I mix ground earth pigments with natural bases and oils to produce my paints. Hand crafted arrowheads, shells, feathers, and various trade beads are hand sewn, wrapped, and tied with sinew. I feel that natural resources lend a sense of authenticity to my work. Hand painted on deer, this hide is stretched and tied with sinew onto a Saguaro cactus frame, then adorned with bone beads and feathers. Approximate Size: This painted hide is now part of a private collection. Orders can be taken from this original. Though every effort is made to keep the design as close as possible to the original, there will be slight variances in size, shape, color, and design placement. Hand painted on natural caribou, this hide portrays images of big game animals on the wall of cave. It is thought that ancient man would illustrate their most desired game anials this way in hopes that their images would translate into succesful future hunts. They were typically drawn as robust, healthy animals, and sometimes drawn in groups to represent plentiful herds. It is likely the ancient artists took their illustrations very seriously and would use them in spiritual ceremonies before the onset of and important hunt. 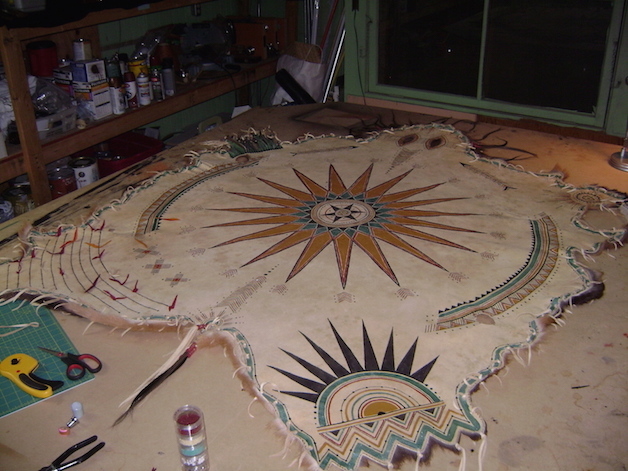 Hand painted on caribou hide, this image symbolizes the importance of the sun to the circle of life. The sunburst represents the great soul spirit (the sun), which is the center of all life. The hunters' arrows point in the four earthly directions. The dots represent animal tracks. Typically, the color red was sacred and represented warmth and blood (life). Hand painted on deer, this hide is an artistic adaptation of several documented rock art symbols from the southwest. Prehistoric rock art has been a fascinating subject for generations. The true meaning and purpose of ancient rock art is still unknown. However, many scholars have speculated they were representative of the typical human needs and desires. Such as, spiritual worship, hunting and gathering, defense, story telling, record keeping, travel and the natural elements. Hand painted on caribou, the symbols on this hide are adapted from a warrior's shirt dated from around the 1850s. The symbols are cataloged as Chiricahua Apache. They represent shields, lances and war bonnets. Shields are represented as large circles and are adorned with black tipped eagle feathers. The circular red band was probably a representation of trade cloth typical of that era. The zigzag lines on the unadorned shields represent enemy bullets being deflected. Split horn war bonnets are a sign of an accomplished warrior. The long feather trailer on the bonnet meant the warrior was held in high esteem. These were adorned with eagle feathers, trade cloth and sometimes ermine tails. Lances were typically weapons of a mounted warrior and signified his position as such. These were very effective weapons and were also adorned with feathers, trade cloth and fur. The Native American warhorse was highly honored and respected by its rider. The owner would take great care in selecting symbols and other decorative accents for his horse. He would often choose tribal symbols that would convey power, protection and the courageous heart of the horse and himself. Hand painted on a natural caribou, this hide illustrates a transition from horses running wild and free to a fully decorated warhorse and its rider. Painted on elk, here is a buffalo hunt as is would appear in pictograph form, or an ancient drawing in a cave. To the Native Americans, the buffalo was their single most important natural resource. The animal provided food, war and hunting implements, leather for tepees, clothing and even glue. "Tantanka" means Buffalo. Approximate Size: 68" x 91"
The ancient Mimbres culture inhabited the southern New Mexico area for more than 1,000 years. "Mimbres" is the Spanish word for the willow trees that grow along the river valley region. They were mostly known for their extraordinary pottery, which was intricately painted with complex graphic designs and animal figures. Painted on Caribou, and embellished with turquoise and jet beads, this hide contains elements of the Mimbres' beautiful, artistic style. Decorated war horses are set free to relax and mingle after a long day of battle. Painted in a loose watercolor style on white tail deer, this hide is framed with burned in native symbols, beaded fringe, and feather accents. 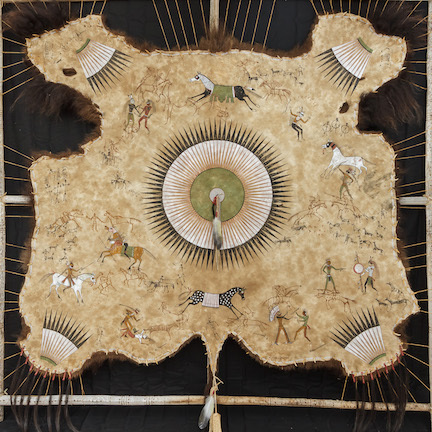 Painted on elk, this hide represents a "Shaman's" ceremonial robe. A Shaman is a person who is a messenger between the human world and the spirit world. Their primary purpose is to restore balance and harmony to the physical world by drawing from the spirit world. By connecting with the supernatural, Shamans will treat physical, emotional, and psychological illnesses by mending the soul. The Shaman will also enter the supernatural realm to seek solutions to problems that may arise within the community. Symbols of Cheyenne ceremonial fans and bustles dance around on this hand painted deer hide. Many Cheyenne ceremonial items were decorated with eagle feathers attached to ornately beaded bases. The Native American dance is a ceremony that connects the people with the natural and spiritual world. It is rich in symbolism. Their dance appeases the spirits, and celebrates peace or victory. It also expresses longing and encourages healing. Painted on caribou, this is a traditional story hide depicting the characteristics that make up a typical tribe. The symbols are taken from the Plains Indian culture and represent the sun and eagle feathers. After the Spanish introduction of the horse they turned away from farming to horse back hunting and battle. However, they did still cultivate maize, squash, and sunflower. Painted on caribou hide, this design represents the Chilkat style. The Chilkat are one of many clans of the Tlingit people. The Tlingit inhabit the Pacific Northwest mainland and islands. Their artistic style is easily recognizable with bold black lines, animal/human like creatures, and fragmented designs. The Chilkat where known for their beautifully woven blankets. They would often sew mother of pearl buttons around their blankets or painted leather capes to signify wealth and status. Painted on caribou, the symbols on this hide are adaptations of the Plains Indian tribes. To many of these tribes, the dragonfly symbolized protection and invincibility. Therefore, it was often painted on war shirts, war shields, warhorses, and teepees. To the Navajo, Hopi, Apache, and other southwest tribes the dragonfly often symbolized transformation and life's ever-constant process of change, happiness, speed, water, or purity. Painted on white tail deer, this design features highly decorated Plains Indian warriors and their horses just returning from a raid. I decided to call this hide "Tribute" in honor of the talented Lakota Sioux artist, Sonny Tuttle. "Tribute" is patterned after his beautiful style of hide painting. Painted on caribou, primitive horses run wild and free while human hands appear to be reaching out to capture them. This is my adaptation of the ancient cave drawings of northern Europe. Found in countries such as Fance and Spain, the drawings are considered some of the oldest and most sophisticated ever discovered. Five Crows was a Flathead Indian chief whose ledger art played a significant role in the study of Plains Indian biographic art. "Talk of the Tribe" in progress. To purchase my art, or if you just have a question... Contact me!